By night in Joshua Tree Park, you can see ALL of the stars and the Milky Way. Tonight my husband and I went to see the falling stars as it was reported in the local paper today that there would be more than usual. My camera would not take a photo of the starry skies to do it justice, however, we were there back in April when I took these photos during the day. Rockclimbing enthusiasts from around the world come here with their ropes and hooks and other equipment so that they can rappel away the hours and get breathtaking views. 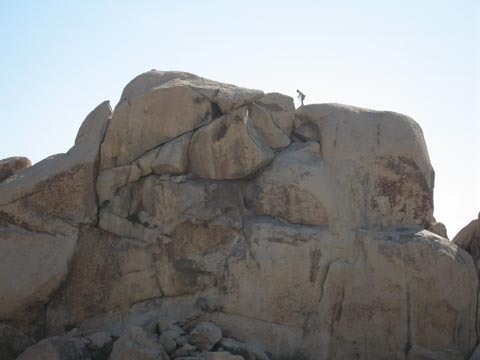 Actually, you can have fun climbing these rocks without any special equipment! 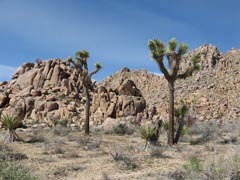 You may recall that the mega rock group U2 named one of its albums Joshua Tree after a visit here. It’s certainly a place that you will never forget once you’ve been here. And if you can, you want to return again and again, throughout the seasons. 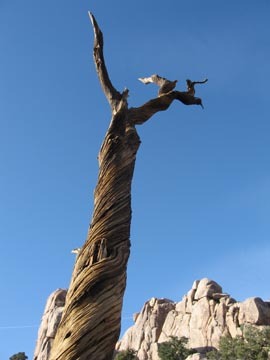 The Joshua Tree itself is actually a Yucca brevifolia plant, and there are plenty of them throughout the park. 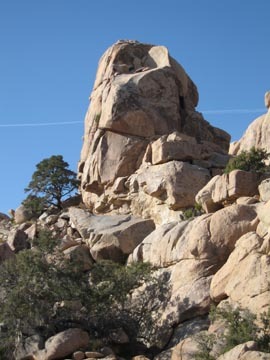 It is commonly believed that there are special sacred forces in the area of Joshua Tree Park. I wouldn’t doubt it. 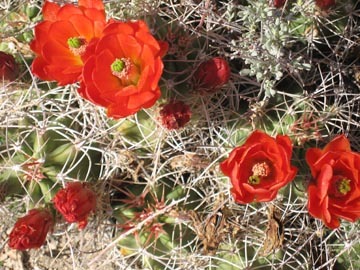 Spring is an especially wonderful time to visit this park, because of the pleasantly cool temperatures and the plentitude of desert wildflowers. Be sure to remember to bring the usual when you hike here, such as sunscreen, a hat, water and your cell phone, although it may not work in this wilderness. 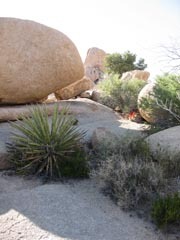 Joshua Tree State Park is about an hour from La Quinta, and a nice drive. You might want to stop off at Pappy and Harriett’s in Pioneertown for some delicious ribs and a beer on the way home. They also feature live music at night. It’s a wildly eclectic group of people there and it’s usually packed on the weekends. Crossroads Cafe is a great place for breakfast or lunch and it’s just before you turn from Route 62 onto Park St. which leads to the main entrance of the park. There are a few galleries and boutiques around Crossroads Cafe too, including a store that caters to the serious rockclimbing enthusiasts. Bring your camera! You’ll be wanting to take alot of photos here. Enjoy! 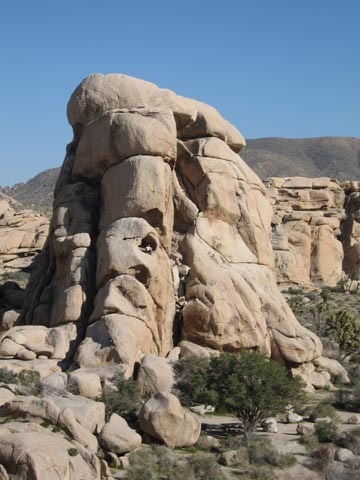 Joshua Tree Rocks with Tree: A Chinese Painting? This is the view of the former Blixseth Estate in Rancho Mirage known as Porcupine Creek as seen from the popular Bump and Grind hiking trail that can be accessed from Painter’s Path, behind the Desert Crossing Shopping Mall. This is about as close as anyone, including myself, a licensed real estate agent working full-time for Prudential California Realty, can normally get to this sprawling property. As soon as I read in the local paper The Desert Sun that the property was for sale for $75 million, I called the real estate agency representing the investors who are now selling this property, to see if I could arrange a private viewing or participate in a broker’s open house. But, alas, no dice. I was told by the agent who answered the phone that only about 1500 individuals in the world would have the wherewithal to be able to afford this property. Therefore, the agency was not going to waste their time with lookyloos. The agent didn’t actually say this but it was understood. After all, to open up a property like this for viewing is, of course, very time-consuming and not only that, there are the security issues to consider as well. I understand. But, since I love to look at luxury properties, I was very happy to see that in this month of August, the glossy magazine Palm Springs Life features a detailed article with lots of sumptuous photos of Porcupine Creek. I was told a couple years ago by a writer for golf magazines at a local Starbucks, before the financial troubles of the Blixseth’s which forced them to sell the property, that he thought Porcupine Creek had the best golf course he had ever seen. Even in the current article that appears in Palm Springs Life, according to the magazine “Golf Digest”, Porcupine Creek is ranked as the 13th best private courses in California (2007-2008), which placed it ahead of Tradition Golf Course, The Reserve, Monterey Peninsula’s historic Dunes course, The Links at Spanish Bay in Pebble Beach, The Vintage Club (where Bill Gates of Microsoft owns a compound), and Bighorn Golf Club. The architect of the former Blixseth estate is Narendra Patel, who is famous world-wide for his impressive architectural designs for private residences and commercial buildings, such as his latest project, a luxury hotel in China. His headquarters is right here in the desert, in Rancho Mirage. He is the architect of an impressive home which was one of my listings which was listed at $6.95 million and eventually sold as a short sale, with me as the listing agent of record. I met Narendra in person when he attended a slideshow and talk presentation which I gave at Cuistot Restaurant about Luxury Real Estate, both here in the desert and in Dubai, since I had just returned from a trip there. He designs gorgeous homes in styles that range from Tuscan to contemporary modern. I am a huge fan of his, one of legions. I was honored that he and his wife attended my presentation. According to the Palm Springs Life article about Porcupine Creek, entitled “Grand Luxe”, Patel took trips to France and Italy, visiting many ancient chateaux which he studied and drew from them for inspiration for designing Porcupine Creek. According to the article, Patel stated that, “The furnishings came from antique collectors from France and Italy” and “The carved fireplace in the great room came from Florence.” Stained glass windows from old European churches were imported and used to re-created windows and domes throughout the estate. Hand-painted murals adorn ceiling and walls. The overall effect is definitely regal. The golf course itself was designed by Tim Blixseth, with some help from such golf luminaries as Tom Weiskopf, Dave Stockton and Annika Sorenstam. With the many guest houses surrounding the main house, this estate seems like a likely candidate for being made into a public resort, however, according to the article, a development agreement rules out using Porcupine Creek as a commercial resort. Therefore, the article concludes, that someone like Donald Trump, who owns Mar-a-Lago in Florida, could make Porcupine Creek, a west coast version of that estate. August 1, 2010 These photos of Santa Monica Beach were taken yesterday. Even in the summer, there is often a cool breeze and an overcast there. It didn’t make me want to jump into the water, but I did have a nice relaxing snooze on the beach. It’s a great way to unwind, with the sounds of the waves, and children playing. 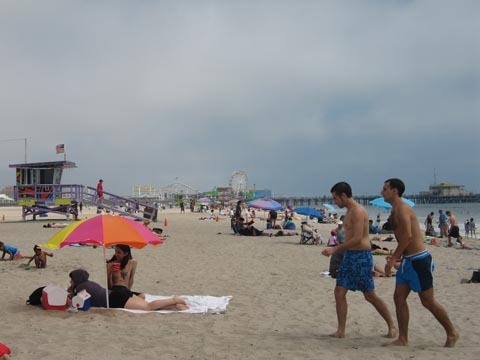 The air is at its very freshest at the beach and it is known to have high levels of ozone that is good for the brain. All I know for sure is that I feel totally refreshed and invigorated after a nap on the beach. 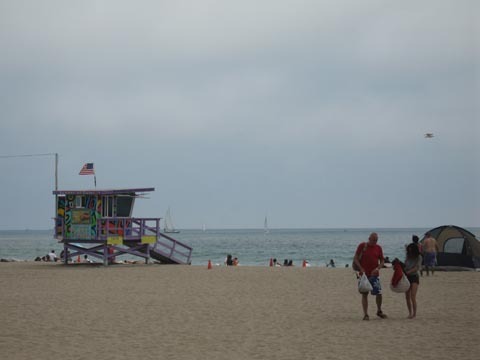 Santa Monica Beach is a great long stretch of beach, with colorful lifeguard houses and out in the horizon sailboats make their way and airplanes trail banners advertising various alcoholic beverages. The view to the east is the Santa Monica Wharf with its huge ferris wheel. 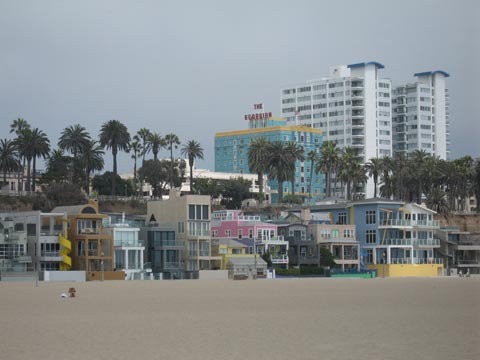 And the view behind, is of unique and some very colorful beach houses, with the Palisades Park and Ocean Ave. high above. 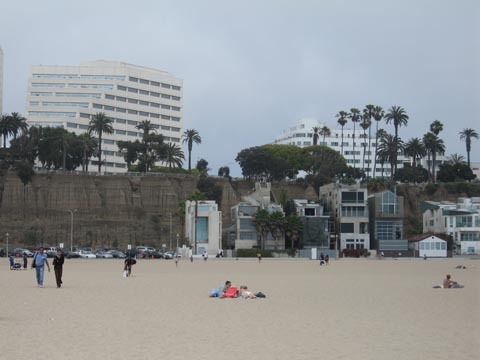 The Shangrila Hotel is the white art deco building on the right, above the beach, and it’s been a popular hotel with people in the film industry for decades. It has been recently refurbished. Just a half hour away, are the ultra chic stores of Beverly Hills with luxury cars lining the streets. 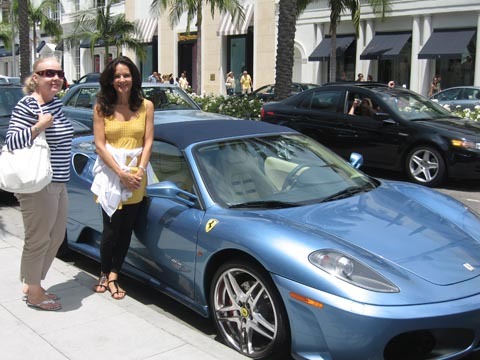 This photo below was taken on Rodeo Drive, with an old friend who is lucky enough to live in this rarified neighborhood. I just happened to walk into the showroom of UTOPIA, at 421 N. Rodeo Drive, Garden Level, Beverly Hills, and learned all about the 971 foot long ocean liner that is being built now in South Korea that is offering up to 200 condominium residences ranging from 1,400 square feet to 6,600 square feet and beyond, starting at $3.9 million. One customized home is costing the new owner $160 million. I was invited on a personal tour of the showroom by the captain of Utopia, Captain Ola Harsheim, who was the former captain of The World Residences, a similar but smaller luxury cruise ship offering deluxe residences. I saw exact replicas of what the kitchens and bathrooms will typically look like in the residences on the ship. Outfitted in beautiful woods and exotic granite, they were indeed impressive. The Utopia is slated to be ready for its maiden voyage in 2013. Aboard the Utopia will also be a 204-room boutique hotel along with world class restaurants, shopping, entertainment, sports activities and more. There will even a “marina” with various sailboats, and watersports vehicles to choose from, inside the stern of the ship, for residents and guests to use dockside. The main thrust of this luxury ship’s promise to its residents is that it offers “a perpetual tour of the world’s biggest events like the Cannes Film Festival, Monte Carlo Grande Prix, the Olympics” and all the fun hot spots around the world, mostly in Europe, Asia, South America and Australia. Besides the Beverly Hills showroom, where I was treated to a ten minute DVD screening, I learned that the Prudential offices of Douglas Elliman are representing UTOPIA and offices are in New York on Madison Street, New York City. Since it just so happens that I am a real estate agent for Prudential California Realty, I am happy to showcase this special real estate opportunity. 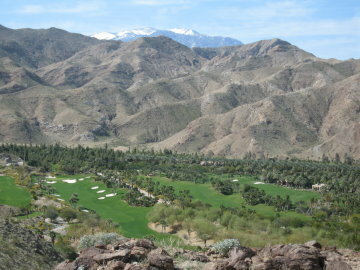 Here in the desert cities of Palm Springs, Palm Desert, Indian Wells, Rancho Mirage and La Quinta, there are also many golden opportunities to own luxury real estate. Some of our luxury communities include Big Horn, The Quarry, The Tradition, Indian Wells Country Club, The Hideaway, the Madison Club, The Vintage and several more. If you are interested in luxury communities here in the Coachella Valley, please contact me at 760-587-6009 for more information!